Vice Chairman of the Enmore Neighbourhood Democratic Council (NDC), Iqbal Dawud on Saturday denied that there was a plot to sell several computers that were seized by government earlier this week, saying they are the Council’s property and a decision had been taken to sell them because they are outdated. He said the decision was made at a public statutory meeting of the NDC and recorded in the Minutes, and so there was “nothing sinister, secretive or illegal” about the move as was being claimed by the eGovernment Department of the National Data Management Authority (NDMA). “The truth is that these computers are the property of the NDC. They are outdated and most of them were malfunctioning. As a result, a decision was taken by the NDC that these computers would be sold, if possible, and replaced by the NDC with a new compliment, so that the community can continue to benefit from their use,” said Dawud. The Enmore NDC said it rejected government’s claims that there was “a plot was discovered to sell” the computers, which were seized by State Assets Recovery Unit (SARU) on Thursday. “There was no such plot and nothing clandestine or unlawful was intended,” said Dawud. The opposition People’s Progressive Party (PPP), which controls that NDC, says legal action was being contemplated. 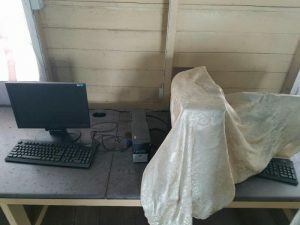 The Ministry of Public Telecommunications has said the the 15 computers, which were in a state of disrepair, improperly stored in dusty conditions and appeared unused for a long time, would be returned to the Enmore community once it has been agreed that they would not be sold or otherwise disposed of. Government assured that eGovernment fully intends to support the residents of Enmore/Hope under its Community ICT hub initiative which provides free Internet service and computer skills training.